When is the popular festivals held in temple and shrines in Kyoto? Temples and shrines hold a memorial service for the day related to gods. It is believed that we can receive more blessings if we visit in the memorial day, so some temple and shrine in Kyoto hold open air markets in the day every month. Used kimono, antique tea utensils, handmade goods are sold. Many people visit these shops to find a bargain. Foreign tourists also come to find interesting souvenirs. Every month in 25th. 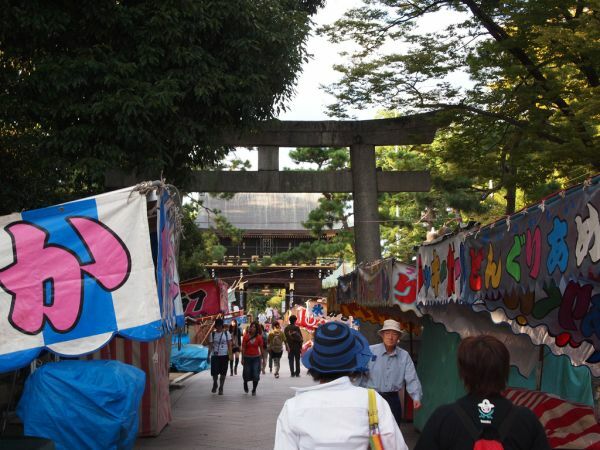 The fair day in Kitano Tenmangu is called “Tenjin-san” among Kyoto citizen. There are shops of used kimono and antiques. We can find tasty smell of small sponge cake called “kasutera” and grilled noodle “yakisoba”. I found a tea utensil shop near the back gate of the shrine. A owner was selling historical tea bowls there. Entering the back gate, there is a Japanese café selling “Cho-goro-mochi”, which is the famous Japanese sweet dumpling of this shrine. Some people in Kyoto buy them for their children to receive the power of Sugawarano Michizane, who is the god of the wisdom deified in Kitano Tenmangu. We can see beautiful plum flowers in the beginning of the spring and red maple leaves in autumn in the shrine. It’s near from Tea Ceremony Koto by city bus. From Kinkakuji-michi bus stop, it’s about 6 minutes to Kitanotenmangu-mae by 101 or 102. Every 21st, it is the biggest open air market in Kyoto called “Ko-po-san”. A Buddhist priest Kukai(Ko-po taishi) passed away in March 21st, so the fair day is 21st every month. Japanese paintings or calligraphies, and used clothes. The old kimono sold here seems to be used by ordinary people than rich noble people. We sometimes find English tags for foreign tourists also. In addition to antiques, many handmade goods are also sold. 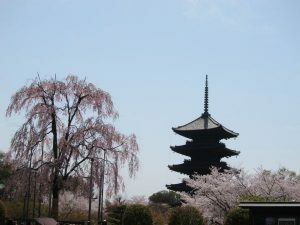 In Toji, we can see 5 stories of pagoda, which is the symbol of Kyoto. 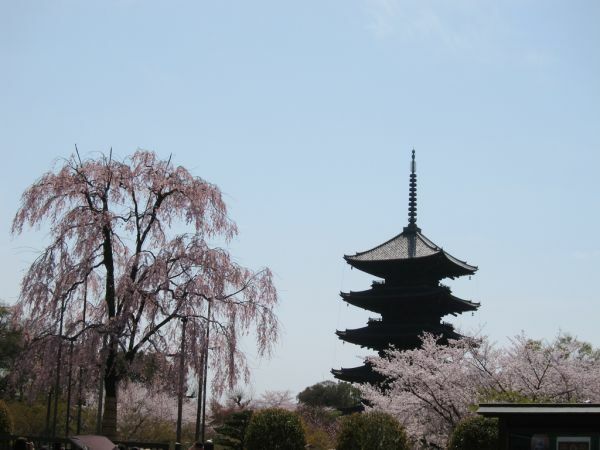 It’s 55 meter high, the highest pagoda in Kyoto. ＊It is held even it rains, but the number of the shops will decrease. The best sweets to pass the exam! This is Japanese dumplings in Kitano Tenmangu, “Cho-goro-mochi”, which are sometimes thought to be good to receive wisdom. In the fair day of New Year’s day, we can buy them in the shrine. 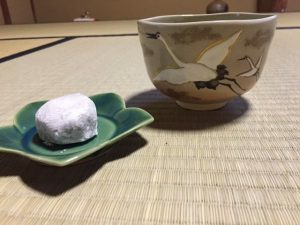 In addition, this dumpling has long history from 1587, when Hideyoshi Toyotomi (1537-1598), the strongest samurai in those days hold a big tea ceremony in Kitano Tenmangu, a man named Cho-goro was selling the delicious dumplings. Hideyoshi loved the sweet. From then, the dumpling is called “Cho-goro dumplings”. I chose a tea bowl of cranes with sunrise, which are thought as the lucky motives in Japan. 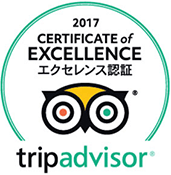 Not only in Kyoto, but also other prefectures or maybe in other countries there are famous sweets thought as lucky charms. It will be a happy break time for the people studying hard for an exam.